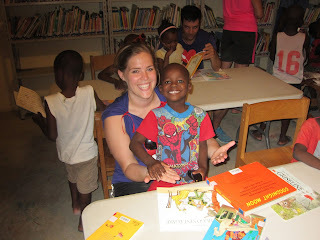 Today marked our second to last day in Haiti. It was been such an amazing experience so far and can't believe there are only two days left. This morning we set out for Grace Village in Titanyen. I was happy we were going because a bridge had collapsed a couple weeks ago and it wasn't a for sure thing that we would get to go. It was about an hour drive and we had the opportunity to drive through the Haitian country side, which is absolutely stunning. When we arrived in Grace Village we were greeted by some of the children who live at Grace Village. 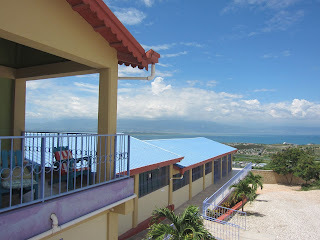 Grace Village is a school for over 400 children who live in Titanyen and home for the 74 children that live there. The school at Grace Village is provided to the student at a fraction of the cost that many other schools in Haiti cost and allows many more students to attend school. Only about 50% of the children in Haiti get to attend school. The children that live there live in family style homes with a kitchen, family room and a house mother or father. It was such a wonderful place to visit, it is located part way up on the mountain and the view looking out was incredible. I remember walking around Grace Village being filled with joy and peace knowing that God had such a huge role in creating such a wonderful place for these children. After going into Cite Soleil and seeing the other orphanages it was very uplifting to see the wonderful place these children get to call home. They were happy, health and ready to show us all around Grace Village, which includes a clinic, school, playground, fish tanks full of tilapia, and there is also a church and bakery, that is part of Grace village, which is not far a way. Overall it was one of the most joyful place, I feel like we have had the opportunity to visit. After our time at Grace village it was time to visit the elders in Titanyen; Healing Haiti goes to about 28 elders homes and delivers three meals a day six days a week. Today we were going to visit four different elders and bring them a meal and wash their hands and feet. The first home we arrived at was two sisters, they were so excited to see us and invited us into their backyard. One of the Haitian men who was with us today had a keyboard, which he started to play and many of the children began to sing as the driver played God is Good (I can't remember if this is right). Washing the women's arms and legs and hearing the music fill the yard I could feel God all around us blessing these women and the children. We had two more homes to visit after, a blind man and another woman. The blind man invited us into his home, which was no bigger then 8 by 10. He was happy to have us and enjoyed listening to the music as it filled his home. Our next elder who we visited was our last stop before returning to the guest house. We walked up to her home and she had a big smile on when she saw we were coming. Her house was no bigger then 10 by 10 but we all went in and played music while we washed her feet and hands. Throughout the trip I have been feeling like I have been called to pray out loud, so many of the team members have this as a wonderful gift, but I feel I do not have a true gift for but through the way I felt at Grace Village and while washing the feet and hands of the elders, I knew I need to pray for this woman. She asked for us to pray for her spiritual life, the grace of God and for God to provide for her and her children, after the pray the look on her face filled me with joy and left a lasting impression. Overall, today was a day filled with joy, happiness and peace for me. 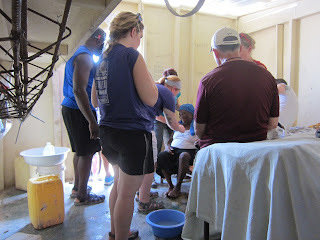 Seeing Grace Village and all of the members of our group washing the feet and hands of elders was such great way to spend one of our last days n Haiti.